Back in February, 5th U.S. Circuit Court of Appeals Judge Edith Jones attended an event at the University of Pennsylvania Law School. The event, sponsored by the Federalist Society, was supposed to be about federal death penalty review—in other words, how federal judges review death penalty cases on appeal. Everyone was probably really excited about it. Judge Jones was maybe all, “Finally, I can wear something other than these Slytherin dress robes!” And the school was like, “All the free tiny bottles of water you can drink!” And the students probably couldn’t wait to mill around nervously after the event, trying to be charming so Judge Jones would offer them a clerkship. Oh, but instead, Judge Jones took the opportunity to say that “racial groups like African-Americans and Hispanics are predisposed to crime,” and that those crimes are more “heinous” than the ones committed by other racial groups. She then said she does not believe in the existence of systemic racism, and went on to criticize the United States Supreme Court for banning executions of the developmentally disabled. Well, okay! Now it’s a party! This week, the NAACP, the Texas Civil Rights Project, and the Mexican Capital Legal Assistance Program filed a complaint of judicial misconduct against Judge Jones because oh, my god, REALLY? The complaint alleges that Judge Jones (appointed by Ronald Reagan, doy) violated the judicial code requirement that judges remain impartial and avoid damaging public confidence in the judiciary. Too late! Consider my confidence damaged. Judge Jones isn’t just any judge; she’s a big-time federal judge that reviews high-stakes cases. For someone like that to reject the notion of systemic racism is a tragedy for anyone with a criminal or death penalty case pending before her. Apparently, this needs to be said: systemic racism exists. 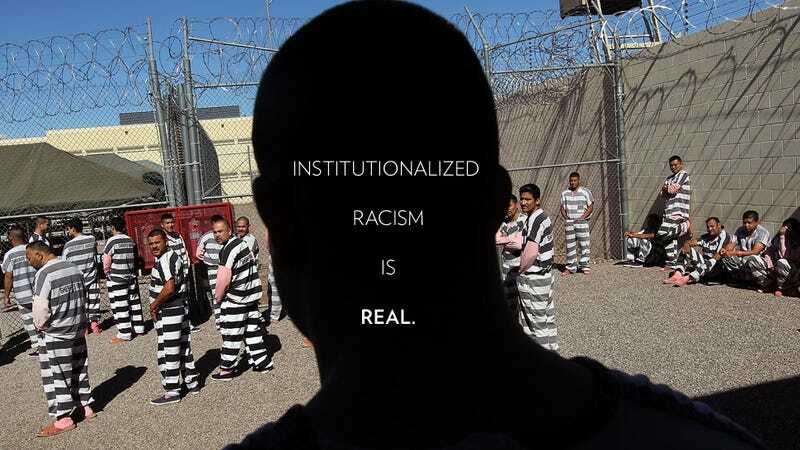 Institutionalized racism is real. It is insane for anyone, let alone a federal judge, to think that certain ethnicities are “predisposed” to crime. That’s because they’re not—but they are unfairly targeted for stop and frisk or arrest. Take marijuana arrests, for example. Black people are arrested for possession of marijuana more often than white people are. Someone please tell Judge Jones that this does not actually mean that black people smoke more marijuana than white people! According to a comprehensive study released earlier this week by the ACLU, overall, both groups consume marijuana at about the same rate. But among 18- to 25-year-olds, white people smoke marijuana at much higher rates than black people do. And yet, black people are arrested almost four times more frequently than white people are for marijuana possession. Maybe black people are smoking a more heinous strain of weed? Perhaps you’re thinking, ehh, big whoop. Judge Jones said black people and Hispanics commit more heinous crimes than white people and marijuana possession isn’t a heinous crime. (Why would you say that to me? Are you trying to hurt my feelings?) Here’s the thing, though. Small-time marijuana arrests are a major point of entry into the criminal justice system. Once you’ve been arrested or convicted, it isn’t exactly easy to find legitimate work. And a criminal record can get you booted from public housing, too. It is these systemic factors—not predisposition—that force some members of marginalized groups to depend on a life of crime. The idea of someone like Judge Jones, who apparently has no functional understanding of how people end up in the criminal justice system, reviewing criminal or death penalty cases on appeal is absolutely terrifying. (Homegirl is also a total nightmare when it comes to women’s issues.) If Judge Jones really thinks that the defendant’s race alone indicates a propensity to commit violence, well, that’s racist. And it’s pretty heinous, too.